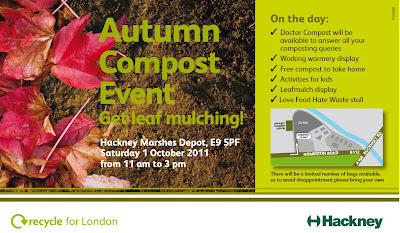 Hackney’s autumn free compost give away event will take place this Saturday! We will be there offering tips and advice on how to use autumn leaves for leaf-mulching or any other composting queries you may have. We will be waiting for you at the Hackney Marshes Park Rangers Depot from 11am to 3pm this Saturday, 1st October 2011.